Everybody knows that drug use and music were nearly inseparable in the ’60s and ’70s – think Woodstock and obvious song titles like “Cocaine” by Eric Clapton and “Heroin” by Velvet Underground – but do substance abuse and music still go hand in hand today? 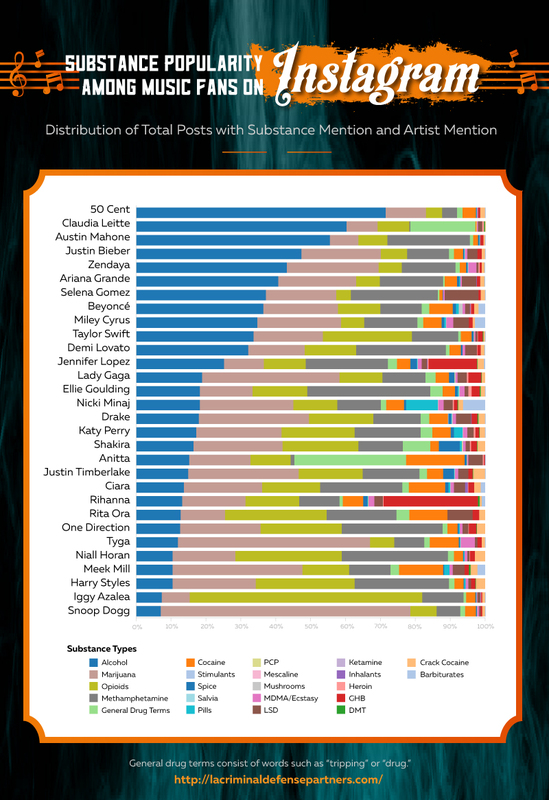 To find out, we analyzed over 6 million Instagram posts about 30 of today’s hottest artists to discover which music icons inspire the most mentions of alcohol and drugs (both legal and otherwise). The results? Let’s just say perhaps there’s a reason The Weeknd can’t feel his face, and it has nothing to do with the euphoric effects of love. Interestingly, the top three substances mentioned alongside musicians aren’t necessarily illegal and definitely aren’t the psychedelic drugs that were so often cited in the lyrics of decades past. Alcohol, for example, makes up more than a quarter of all substance mentions, and opioids (which includes legal prescriptions like Vicodin and OxyContin) account for a little more than 15 percent. Marijuana, which is about 27 percent, is legal for recreational use in Colorado, Washington, Alaska, and Oregon; it’s licit for medicinal purposes in 19 states. Around the world, countries such as the Netherlands, Colombia, Portugal, and Peru have also legalized marijuana in various amounts and circumstances. It seems that Beyoncé really is “Drunk in Love” – at least according to fans. And she’s not alone. 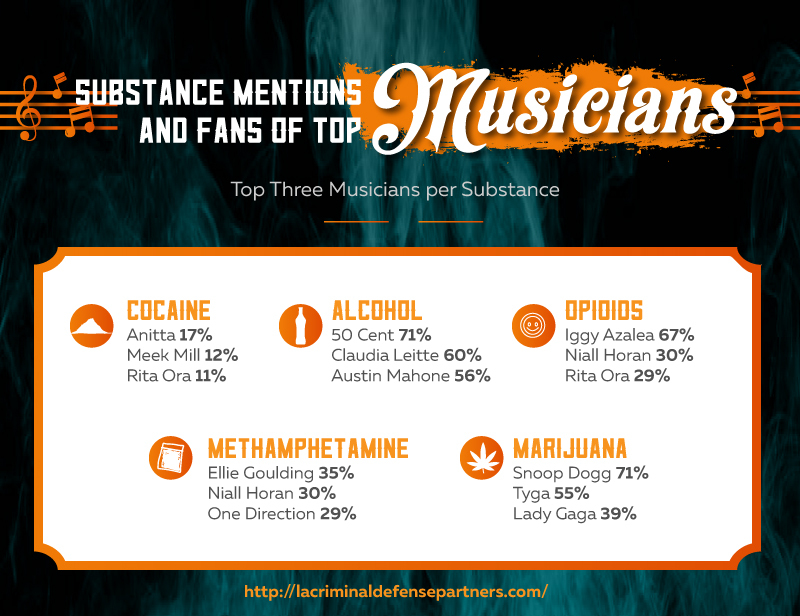 Of the top four musicians most often cited with substances, all have recently released singles that explicitly reference them. In 2015, for instance, Nicki Minaj was featured in the song “Dope Dealers,” adding to her legacy that began with the mega-hit “Super Bass,” in which her love interest “pops bottles” and “might sell coke.” Snoop Dogg’s single “California Rolls” includes the refrain “Get yourself a medical card, yeah (in Los Angeles)” – referencing the fact that marijuana is only legal for medicinal purposes in California. 50 Cent (with his group G-Unit) released the single “Bring My Bottles,” one in a long line of his songs about alcohol. The fifth-most referenced musician, Austin Mahone, however, is something of a mystery, since the clean-cut teen has been quoted as saying he wants to stay straight and avoid being “that guy … going to rehab.” Let’s hope the YouTube sensation, whom many have compared to Justin Bieber, doesn’t follow the Canadian singer’s lead when it comes to skirmishes with the law. Out of a possible 22 drugs that each could have been tagged with, many artists were referenced with more than 15. At the lowest end of the spectrum: British pop singer Rita Ora, who was mentioned alongside nine different drugs – most prevalently opioids. On the opposite end of the scale, rapper Meek Mill was tagged with a whopping 21 substances; marijuana made up 37 percent of his total related tags. Although some artists are fairly equally associated with many different substances, others are clearly the king (or queen) of one in particular. For example, in 71 percent of posts that mentioned Snoop Dogg and a substance, that substance was marijuana. The same was true for 50 Cent, but his “drug” of choice was booze. It was a similar runaway for opioids, with 67 percent of Iggy Azalea-related substance posts referencing these drugs. Why exactly is anybody’s guess, but it may have something to do with the fact that the rapper (and much of her fan base) hail from Australia, which ranks high on global drug abuse lists and has specifically seen a large rise in opioid use in recent years. Among the more surprising inclusions is Niall Horan, from the British boy band One Direction, on the lists for both opioids and methamphetamines. While there appears to be no real evidence that he’s involved in illicit drug use, that hasn’t stopped tabloids (and, no doubt, social media users) from speculating that the heartthrob is, in fact, breaking bad. Whether substance use and abuse are a part of their message and image (as with Snoop Dogg’s marijuana obsession) or certain artists are simply loved and referenced by fans who “choose to use” is unclear. What is obvious, however, is that drugs and music are still very much an item, sticking together through decades of new music genres, new drugs, and even changes in the legal code. So whether it’s Johnny Cash and his Cocaine Blues or Halsey, “high on legal marijuana,” music and substance abuse will continue to go together like, well, John, Yoko, and hashish. 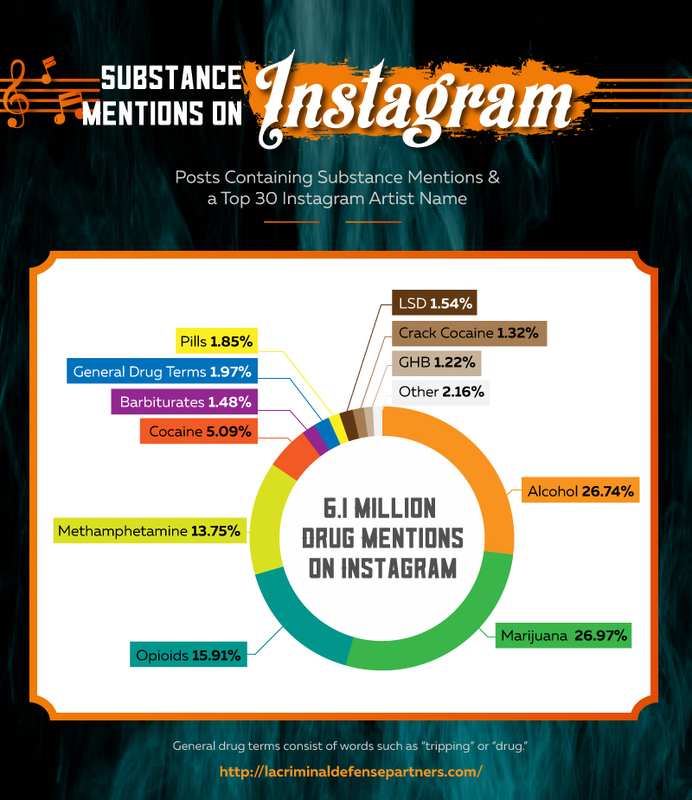 We scraped Instagram for over 6.1 million posts mentioning 30 different popular music artists to determine the percentage of posts that contain public mentions related to various intoxicating substances such as alcohol, marijuana, and many others, including 82 popular terms or slang associated with each substance. 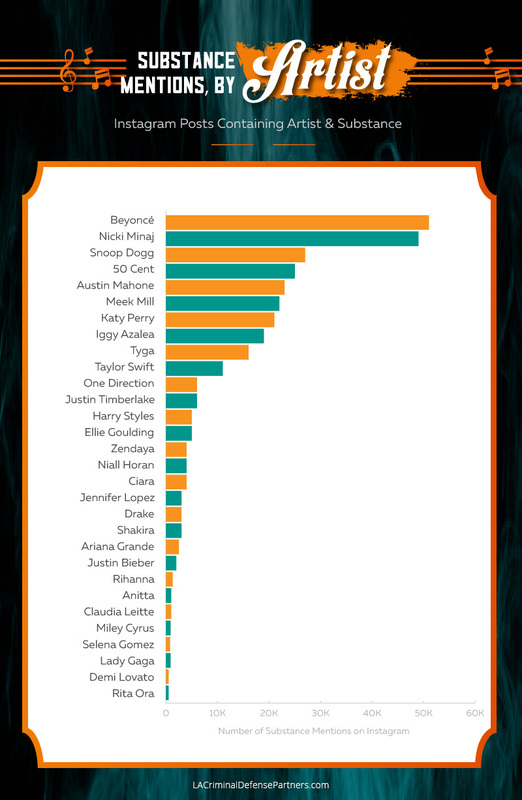 Musicians were selected by being in the top 30 on Iconosquare.com’s Top Brand for Musicians list at the time the research took place; all posts were collected during November 2015 using the Instagram API. Posts containing multiple mentions of a single substance have been combined. A full list of the substances we searched for within the posts can be read here. In the Substance Mentions on Instagram graphic, the “Other” category is made up of a combination of intoxicating substances which include MDMA-Ecstacy/Molly, Spice, Mushrooms, Heroin, DMT, Inhalants, PCP, and Stimulants.